Softening & Water Softeners | Hungerford & Terry, Inc.
With most types of H&T gravelless units, there is no concrete fill to buy and install in the bottom of the filter below the strainers. The tank height is lower which means a saving in tank cost and its delivery cost, and the tank is easier to handle at the job site during installation. The lower tank height permits its use in a lower height room or building. The space in the bottom of the unit previously used for a gravel supporting bed may be used for a greatly increased bed depth of filter media or zeolite, thus providing a greater flow rate and/or softener quality. Rugged, corrosion-resistant, stainless steel strainers, uniformly spaced, extend completely across the entire tank bottom and provide better collection of the treated water and more uniform distribution of the backwash water. Strainers may be factory-installed, if desired … at a small additional cost. Units have an extremely low head loss, even when equipped with greater bed depths of filter media and operated at a greater flow rate. A lower overall installed equipment cost. 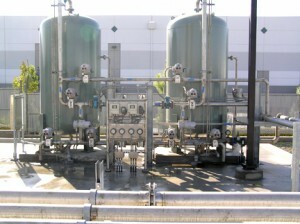 This construction is also applicable to overhauling, rebuilding, and modernizing old, low height filters and softeners. The H&T water softener system utilizes cation-exchange resin operating in the sodium cycle with salt (NaCl) regeneration to remove the hardness ions. Calcium and magnesium will exchange for sodium on cation resin. This reduces the hardness and increases the sodium in the treated water. For industrial applications, it is typical to treat 100% of the water to achieve the lowest hardness. For municipal potable applications, a portion of the water normally bypasses the softener and is blended with the effluent to reach the desired hardness level. Both automatic and manually operated systems are available, as are packed-bed and upflow-regenerated systems to improve treated water quality where low-hardness leakage is required. Several different resin options are offered by H&T to improve efficiency or for severe-duty applications.